Eaton student Katelyn Niehuas recently competed in the Honors College Awards Competition at BGSU in Bowling Green and has been offered the Presidential Scholars Award from the BGSU Honors College. Niehaus will be attending BGSU in the fall with a major in Middle School Math and Science Education. EATON — Eaton student Katelyn Niehuas recently competed in the Honors College Awards Competition at BGSU in Bowling Green and has been offered the Presidential Scholars Award from the BGSU Honors College. This scholarship is projected to cover $11,220 per year and $44,880 over 4 years. According to Bowling Green staff, each year, the Honors College collaborates with the Office of Admissions to welcome nearly 350 prospective honors students and their families to campus for Scholar Day. This one-day event is an opportunity for them to learn more about Bowling Green State University and what it means to become a part of the Honors experience at BGSU. Scholar Day took place this year on Friday, Jan. 26. Prospective students were invited to participate in a mock Honors College class experience, interact with current students, tour the Honors Learning Community in Founders, and talk with Honors College staff members. In addition, family members and guests had a chance to hear from the parents of a current Honors student. Not only did this give the students a great day on campus, but 60 of the highest achieving students were invited to interview for two top scholarships: The Alumni Laureate Scholarship and the Presidential Scholars Award. Niehaus was awarded The Presidential Scholars Award, which is a four-year, full-tuition, cohort-based program comprised of about 80 students (20-22 in each cohort). The curriculum is varied and progressive based on the students’ year in school. During the first year, the focus is community development, goal setting and degree planning, with an emphasis on problem solving. In the second year, the goal is the application of critical thinking skills, while year three emphasizes personal leadership. The goal for Presidential Scholars during their senior year is the integration of critical thinking and a personal leadership plan. There are also social events and an informal mentorship program. “I am so honored to receive the Presidential Scholars Award from BGSU. For this award, I wrote an essay when applying to the Honors College and was selected to be in the final fifty to interview. I then interviewed with a panel of staff and students one weekend at BGSU,” Niehaus said. “It was an awesome experience, not only to get to compete for the scholarship, but also to meet other students and faculty members who I’ll likely see again in the fall. I would like to thank my teachers who helped to prepare me for this experience, as well as my 4-H, FFA, and other extracurricular advisors who have definitely helped me learn applicable life skills. 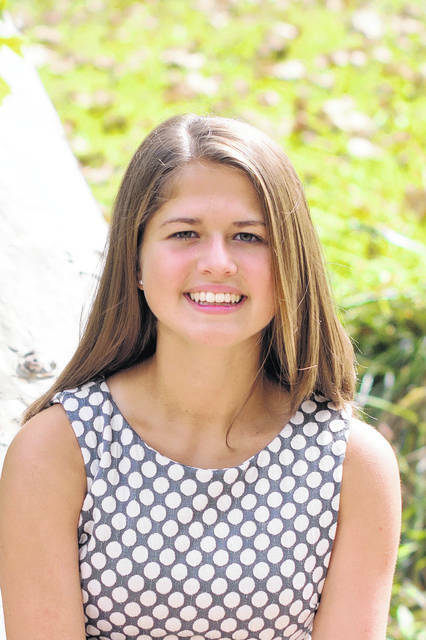 https://www.registerherald.com/wp-content/uploads/sites/41/2018/02/web1_2DSC_4263-2.jpgEaton student Katelyn Niehuas recently competed in the Honors College Awards Competition at BGSU in Bowling Green and has been offered the Presidential Scholars Award from the BGSU Honors College. Niehaus will be attending BGSU in the fall with a major in Middle School Math and Science Education.